The 10 Best Neighborhood Bars in Iowa! Sure, the infinite decibels of dance clubs have their appeal, but sometimes you want to have a good conversation alongside your night out on the town. 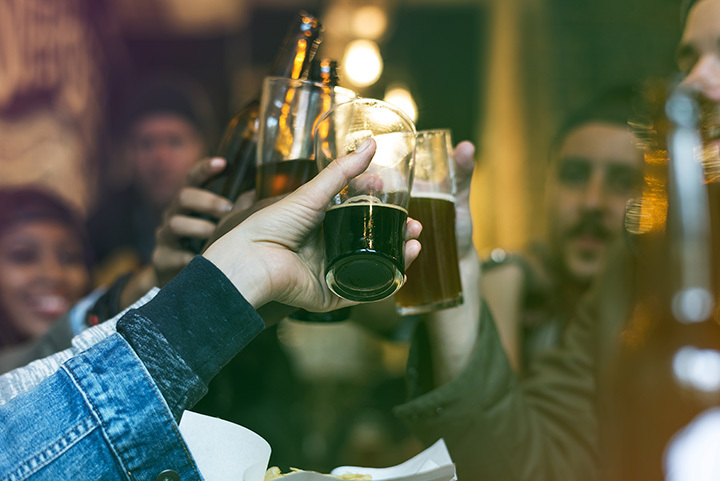 That’s where neighborhood bars come into play, providing not only your favorite beverages served ice cold, but also laying down the perfect backdrop to connect with old friends or perhaps make some new. For a good place to hang out and stay awhile, check out the 10 best neighborhood bars in Iowa. Located in Iowa City, the Deadwood is an institution of a neighborhood bar that serves University of Iowa students and surrounding community members alike. This cash-only bar can be found busy throughout the week, but the door is always in motion come the weekends. With special events like trivia, chili cook-offs, and one of the best costume contests come Halloween, there’s always something new in the neighborhood to check out at the Deadwood. Off Edgewood road in Cedar Rapids, the Westside Lounge welcomes regulars and new patrons every night of the week. Featuring a comfortable and hometown decoration, the Westside Lounge is a great place to belly up and order a drink. Nightly specials entice new favorites throughout the week, and the fun atmosphere inside enables the Westside Lounge to be a favorite place to begin, spend and end the night in Cedar Rapids. There’s always some fun to be had at the Locust Tap in the East Village of Des Moines. This classic establishment has been around the block for more than a few years in Des Moines, and to this day it’s a welcoming joint to grab a drink in. The Locust Tap is most festive come certain holidays of the year, but anytime this warm bar and corner location is enjoyable to sit down and grab a beer. Good conversation and great drinks are just a few of the things you can expect out of Work and Church Booze Parlor of Sioux City. This small bar packs big excitement into the evening hours, particularly on the weekends where the energy amps up from the Sioux City community. Order one of the nightly specials or go for your favorite, whatever you drink you choose will pair nicely with the good company found throughout this watering hole. Open daily from 11 a.m. to 2 a.m., Boozie’s Bar and Grill is an upscale hole in the wall that can have you drinking and dining satisfied throughout the night. While the daily drink specials and fanfare favorites from the grill tend to draw a crowd, what makes this Davenport bar extra popular is the fun company found inside. Great for long-lasting locals of the area and out-of-towners looking for something new, everything you need to have fun can be found at Boozie’s Bar and Grill. The Club Car of Iowa City is a hidden gem in this college community. Located not far from the popular Pedestrian Mall, the Club Car is posted up right next to the train tracks and on any given night you can find families eating a meal, old-time friends participating in old-time rituals or someone new that has discovered the Club Car for the first time. Offering drink specials, a full bar and a lengthy list of appetizers and entrees, the Club Car can easily be your new favorite once you discovered this tucked-away bar. Right in the middle of downtown Cedar Rapids, Pub217 is the perfect neighborhood bar to catch a bite to eat, catch up with old friends or simply grab a beer after a long day. Combining a welcoming atmosphere with a neighborhood appeal, a full bar with custom cocktails, and their own unique twist on traditional bar fare, with one visit it’s easy to see why Pub217 quickly became an area favorite. The handcrafted burgers on the menu are reason alone for frequent visits. Slightly hidden away on Lower Main Street, the Lift is a local, live-music venue bar with a fun atmosphere. It’s easy to feel like you belong at the Lift the moment you walk into the door, and once the music starts playing it’s easy to feel like you’ll want to stay awhile. To go alongside the good music and company at the Lift, this neighborhood bar features a long menu of craft beer and custom cocktails. Being a TV-free basement bar, the Lift encourages social interaction. A longstanding neighborhood bar in the Sherman Hills neighborhood of Des Moines, Carl’s Place invites the intrepid bar-attenders of the area for a fun night out. All sorts of specials make Carl’s Place the place to be, including an all-day Happy Hour on Mondays, and random free shots on the weekends. Bring a friend or a date, or find a new one at Carl’s Place. Either way, this a great spot for a night out. Popular for Iowa State University students and Ames community members alike, the Tip Top Lounge is a great place to grab a refreshing drink amongst a friendly atmosphere. Located on Lincoln Way, it should never be a surprise to find some alumni frequenting this favorite haunt, and it’s always a crowded house come game days for the Cyclones. Featuring nightly drink specials, special events and always a friendly face in the crowd, to make some new friends in Ames, the Tip Top Lounge is right for you.